– In Texas, 41 innocent lives have been exonerated from wrongful convictions due to DNA testing. – In Collin County, even the Supreme Court says its OK to have the Judge and the prosecutor in a sexual relationship together during the prosecution of a capital murder. Part of why I was surprised of this conviction is because I thought there was no way a guilty verdict would ever come from this case. I sat through parts of the trial and never saw any evidence that even remotely pointed towards guilt. The theory of the case was an odd one to me. In a county where no incumbent judge had ever been defeated, supposedly someone was willing to “bribe” a lawyer to unseat a judge, and reverse rulings already made on their case. The theory was further removed from reality considering Judge Wooten removed herself from the case and never made any rulings that aided the briber. The prosecutor’s theory (an Assistant Attorney General brought in “AG”) was quite close to the plot of John Grisham’s The Appeal, where a Mississippi Supreme Court justice is pushed to the court to hopefully overturn a big corporate jury verdict. In the book, however, the judge to be didn’t know of the reason he was being placed on the court. But the fiction in this case became hard reality for Judge Wooten. She now faces up to 20 years in prison. Along with the possible prison sentence she is also subject to the convicted felony tag, the loss of her job as a judge, and probable loss of her law license. The AG’s theory of the case is that it didn’t matter if the Judge made the favorable rulings or not – the bribe was committed on acceptance of the offer. I guess that is true in theory. 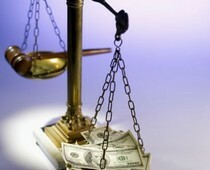 I offer to pay an elected official for some favor, they are guilty when they take the money, not when they do the favor. But a closer look at that idea would show that if the bribed person didn’t do the favor in return for the bribe, then it most likely wasn’t a bribe anyway. The briber in Wooten’s case certainly got screwed out of their $150,000 considering the bribed judge refused to even hear the case much less make favorable rulings. When I was a prosecutor in Collin County, nobody ever asked me how many innocent people I thought I convicted. As a defense attorney, I am constantly asked how many guilty people I get off. The general public perceives the greater “wrong” to be a guilty person getting away with a crime, not an innocent person getting convicted. Although not asked about convicting innocent people as a prosecutor, I thought about it during and after my prosecuting career ended. The stock answer in my mind was that I never convicted anyone. They either pled guilty, or a jury convicted them – never me. My suspicion is that the AG in the Wooten case feels the same way. A jury convicted Wooten – not him. Furthermore, the jury’s verdict justified this prosecution. Except this AG had even more to gain from a guilty verdict. This verdict cleared his name in an FBI investigation against him. The problem with this outcome is that this prosecution could have been pushed forward out of a hope to clear his name – not for a prosecutor’s stated duty of seeing that justice be done. Art. 2.01. It shall be the primary duty of all prosecuting attorneys, including any special prosecutors, not to convict, but to see that justice is done. 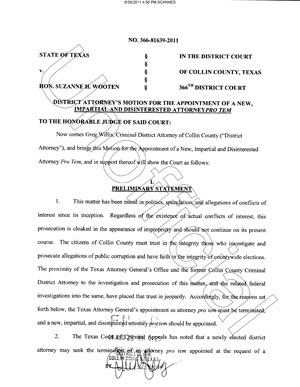 At one point the current Collin County District Attorney tried to intervene and take the case back out of the hands of the AG. This was fought by the AG and eventually overruled by the visiting judge. If a new, uninterested prosecutor were assigned to the case, the outcome might have become more reliable, and easier for me to believe. So here we have it, an AG working for the Republican elected AG’s office, prosecuting a perceived Democrat. If the undertones weren’t enough, during the trial the prosecution politics a focal point of their case. Questions were asked of how many Republic events Judge Wooten attended before running. Not exactly subtle. It had always been a joke that its illegal to be a Democrat in Collin County. Unfortunately this trial brings the joke into possible reality. In the end I am saddened by what seems on all accounts as yet another innocent person being convicted of a crime. If there was any chance at the public having faith in the jury’s verdict, it was lost a long time ago in the face of the overwhelming politics that plagued this case.